I predict good things for people with hearing loss in 2016, especially in the field of technology, where new kinds of devices to improve hearing are booming. In fact, as the Washington Post recently noted, the hearing device market is in the midst of a “profound disruption” — from traditional hearing aids to lower-priced, nonprescription devices — that is making it easier and cheaper for people with hearing loss to get help. But first I want to note a surprising trend: The U.S. private hearing aid market grew 9 percent last year, despite the grumbling about prices — more than $2,300 is the average price for a hearing aid — and a shortage of audiologists. Some of the uptick in hearing aid sales may be due to two new(ish) hearing aids, the Halo by Starkey Hearing Technologies and the ReSound LiNX2, both of which work with an iPhone or other i-device to allow precise manual tuning to a particular environment and then saving that setting so you can automatically go back to the same program the next time you’re in that space. The cost is about $3000 per aid, depending on where you buy them. Another potential piece of good news in the traditional hearing aid market is the expected entry of tech giant Samsung, which has applied for a trademark registration for a device it calls the Earcle. 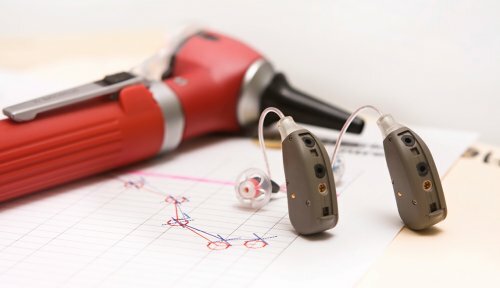 Six big manufacturers dominate the hearing aid market. The entry of one of the largest electronics manufacturers in the world may help consumers by bringing down prices. But the really big news is in PSAPs, or Personal Sound Amplification Products. These devices, which cost around $300 to $350, directly amplify sound into the ear. Because they are marketed as consumer electronics, they are not regulated by the Food and Drug Administration (FDA) and don’t require a prescription. Good products already exist, including the $300 Soundhawk Smart Listening System, which debuted in December 2014. The Wall Street Journal called it “an ear wearable.” The Soundhawk looks like a geeky Bluetooth earpiece. There may be more devices like this to come. Think of the futuristic Spike Jonze movie Her, which made an in-the-ear talking computer seem like the next best thing. “The ear is the new wrist,” tech guru Nick Hunn wrote, taking credit for coining the term “hearable.” He predicts that the wristband — like Fitbit — has already seen its day. Soon everything will be in the ear. Steven Brown, writing for Wired.com, explains why these “activity trackers” will move to the ear and become hearing devices as well as fitness monitors: “Wearables aren’t sticking because consumers are not willing to alter their behavior to accommodate the product.” He suggests that consumers are already accustomed to wearing something in the ear — earbuds, hearing aids, Bluetooth devices, earplugs. Why not combine fitness tracking with music listening — and add a hearing component as well? And someday even a talking computer. All of these devices are technically PSAPs, which received a boost in October when the President’s Council of Advisors on Science and Technology endorsed PSAPs as an alternative to more expensive hearing aids for people with normal age-related hearing loss and recommended that the FDA allow them to be advertised as devices to correct hearing. This month, the FDA announced that it would reconsider its guidelines on PSAPs. But not every new hearing device is designed for the ear. Belgian designer Bruno Vereecke has created a lamp to help people with hearing loss hear better around the dining table. Vereecke’s wife and son both have hearing loss, and he wanted something that would allow his family members to hear each other better. The result is a hanging lamp that is designed to absorb noise, making it easier to hear speech. Testers reported a 15 percent increase in the sounds they could hear. The lamp can also be customized for an individual’s particular hearing loss. My favorite new idea is one shown at last week’s Consumer Electronics Show in Las Vegas: the DiamondZ True Wireless Bluetooth headphone made by Monster Inc. It looks like a 40-carat amethyst nestled into the ear. The DiamondZ is not intended to correct hearing — at least for now it’s only a Bluetooth device. But hearing device manufacturers, listen up! Give us jewels to wear in our ears and hearing aid sales should go through the roof. I can’t read Portuguese. Translation?